Principal Cast : Mandy Moore, Zachary Levi, Donna Murphy, Ron Perlman, Brad Garrett, Jeffrey Tambor, Richard Kiel, MC Gainey. Synopsis: The classic story of Rapunzel, the princess with the very long hair, is a prisoner of the cruel and selfish Mother Gothel at the top of a tall tower. Local thief Flynn Rider, on the run from the King’s soldiers, accidentally stumbles across the long lost princess, and promises to show her a magical light display in order to obtain a stolen crown. Of course, the path of true love never travels a straight line, and a variety of obstacles pop up: from Mother Gothel to the twin towers of the Stabbington Brothers, to a royal horse who behaves more like a bloodhound. As a fan of traditional animation, I will admit to a twinge of disappointment upon learning that Disney’s 50th animated feature would be done using CGI, instead of the lovely hand drawn methods the company was founded on. Just a twinge, mind you, because after seeing the trailer for the film, I thought that perhaps they’d stepped outside the box with this one, and that it could actually be a good film anyway. Disney’s track record with animated films borne of the computer had been relatively hit-or-miss (I am, of course, referring to their non-Pixar output), with films such as Chicken Little and Meet The Robinsons feeling like Pixar-lite entries into the genre of CGI animated films – a fact which only added to my hesitation with Tangled’s production woes. Amazingly expensive to make (according to online sources, Tangled’s budget reached somewhere in the vicinity of $260m, which puts it in the Most Expensive Animated Film category) and having a duo of directors cast aside midway through, as well as a change of title, Tangled had a lot to live up to. Does it deliver the trademark Disney class, or is it a major misfire? A horse with a sword? Okay, now I’ve seen it all…. Long ago, a drop of sunlight fell to Earth and grew into a magical flower, a flower with the ability to keep a person young and virile. Gothel, a selfish and desperate woman, keeps the flower secret for year, until one day the King sends his men on a mission to find it, in order to heal the heavily pregnant Queen. The soldiers do find it eventually, causing Gothel to seek retribution – in the most horrible way. She steals the newborn Princess, Rapunzel, from her crib, and takes her to a secret tower hidden deep within the forest. Here, Gothel pretends to be Rapunzel’s mother in order to draw the magical healing power from the young girl and remain eternally youthful. Due to the flower being used to heal the Queen, the healing power was transferred to Rapunzel’s hair, and is accessed by a simple melody which Rapunzel is forced to recite. Meanwhile, a thief called Flynn Rider, after stealing a crown from the royal palace, stumbles upon the tower in the forest after outrunning some pursuing guards. Rapunzel hides the stolen crown in order to force Flynn to take her to a lantern lighting ceremony, a ceremony which the Princess is unaware is actually in her memory from the King and Queen. Escaping the tower for the first time in 18 years, Rapunzel and Flynn eventually fall for each other, only after a bunch of double crosses and genre cliches are set upon them, in which Mother Gothel uses guilt and guile to return the erstwhile Princess back to her prison… er, tower, in the forest. You wondering if I’m blonde…. “down there”?? 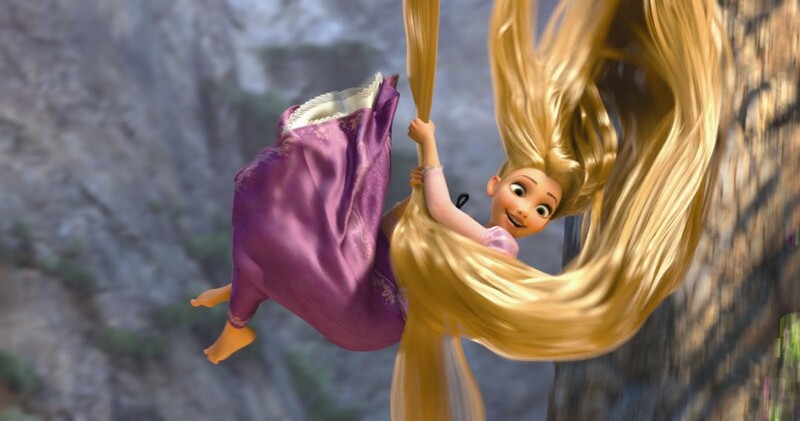 Tangled is pure, unadulterated sugar of the highest order. This is classic Disney, a warm and wonderful throwback to the original Walt-directed gems like Sleeping Beauty and Cinderella – featuring some effortlessly sweet-natured musical numbers and whimsical, delightful computer animation. There’s no overt pop-culture references to be found, the kind that destroyed the eternal appeal of films like Shrek, which became dated about a month after they debuted; nor is there that cynical, wink-to-the-audience edge to the scripting at all: the characters are terribly cliched, the story is as predictable as they come, and indeed, this is exactly the kind of film Shrek parodied to great effect. 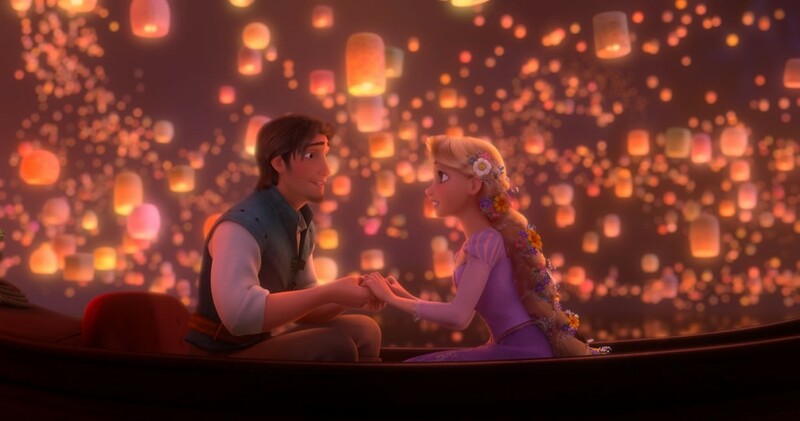 Yet, for all the potential problems the film has in terms of keeping things fresh and updated for a modern audience, Tangled feels fresh and updated, and hardly cliched at all. There’s a simple, refined elegance about the film, and a whole heaping of candy-cane saccharine coursing throughout every line of this films dialogue. Dan Fogelman’s witty, wry script is filled with the sense of magic and wonder Walt infused all his projects with, even when it’s making light of fairy-tale conventions. Flynn’s “here comes the smoulder” moment, Maximus the royal horse, and a wonderfully funny musical number inside a bar filled with thugs and lowlifes, should never have worked in combination, yet they do, all with the hip-smart vocals of Mandy Moore and Zach Levi. Moore, as Rapunzel, is a delight to listen to, with her lilting lyrics and bottled-innocence a complete reversal of Levi’s more sarcastic (and worldy-wise) thief. 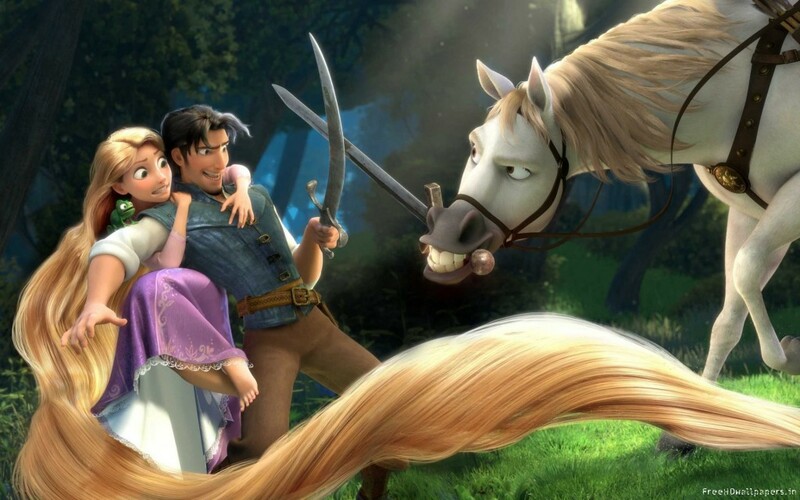 Flynn Rider is the Everyman of the film, the stable, normal character through which the fairy story cliches are filtered. This whole thing’s a fire hazard! 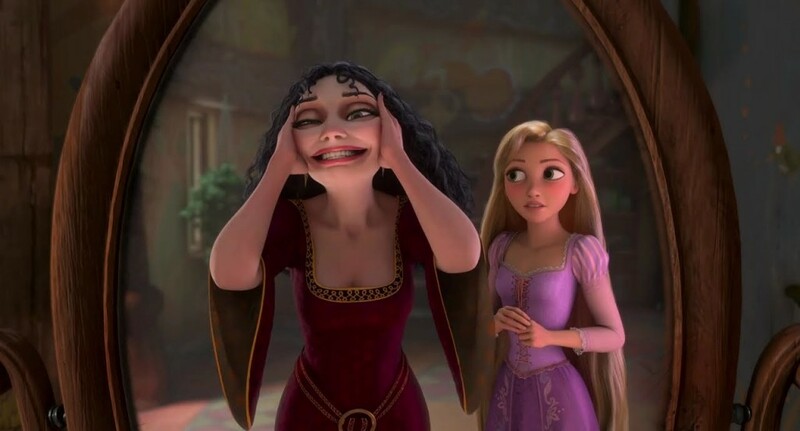 The film’s central villain, Mother Gothel, is less an outright evil person and more a heightened selfish one. Her quest to remain eternally young is the driving force behind the entire story, and is a clever twist on the original fable. Gothel is voiced by Donna Murphy, who truly captures the slimy, cruel nature of the old woman in her vocals. Gothel uses guilt to keep Rapunzel from leaving the tower, a powerful device which, considering the young girl has been locked away for a decade and a half, is almost impossible for Rapunzel to overcome on her own. The insertion of Flynn Rider into her story, and the fact that his very existence contravenes all Mother Gothel has told Rapunzel about the outside world, is the catalyst for the post-tower action. Gothel’s panic upon learning Rapunzel has left the tower is palpable, and Murphy sells it with her vocals, alongside the stunning visuals. Indeed, the visuals on Tangled are, frankly, superb. They’re not photo-real, like, say, Rango or Legends Of The Guardians, nor is the animation as detailed as some of the stuff Pixar put out; as the directors mention in the supplementary material on the BluRay, the film is designed to capture the fairy-tale look, and as such, a lot of the colour, textures and detail reflect the heightened world of fantasy we’re visiting. 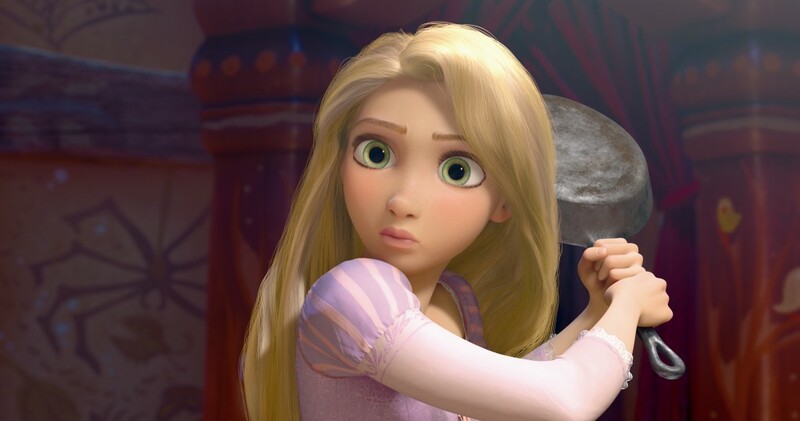 Instead of going for true-to-life detail, the animation team has focused their efforts on capturing the nuances of the characters, opting for the classic Disney look for Rapunzel (big eyes, luscious hair and a come-hither innocence) and Flynn (dashing hairstyle, deep brown eyes, and an impossible chin) as well as the rest of the populace of the Kingdom (the thugs are all square and thick-set, the animals all anthropomorphic). It gives Tangled the look and feel of an early hand-drawn Disney feature, while maintaining the technology of a modern CGI genre picture. The new hair-themed rides at Disneyland went against safety regulations. Where Tangled will meet with a mix of annoyance and delight is in the musical numbers. Disney legend Alan Menken returns to the fold with a bunch of new songs, including the Oscar nominated “I See The Light”, and the truly wonderful “I’ve Got A Dream”, sung in the aforementioned bar filled with thugs and lowlifes. Donna Murphy gets to flex the vocal cords with “Mother Knows Best”, the kind of Broadway style number Menken’s best at, while Moore captures aural gold with “When Will My Life Begin”, her magical lament to being stuck in a tower. The problem I have with some of Menken’s work is that it sounds an awful lot like a remix of some of his more popular tracks from previous Disney hits. I’m no musical expert, so my explanation and reasoning behind this thinking is going to be a layman’s perspective, but “I See The Light” and “Mother Knows Best” both have hints of “A Friend Like Me” (Aladdin), “Go The Distance” (Hercules) and even tinges of Home On The Range thrown into the mix. Is there such a lack of emerging talent in Burbank that somebody else can’t be given a shot at scoring a Disney film? Menken must dread having that red phone ring by his bedside every time Disney want to make an animated film – he’s the go-to guy for them, and while he does put out consistent material year in, year out, is there nobody else willing to have a go at it either? ..what happens when Botox goes bad…. I thoroughly enjoyed Tangled; it’s a perfectly harmless entertainment in the grand tradition of Disney’s pre-50’s best. The animation is superb, the vocal performances spot-on, and the storytelling done with a genuinely loving hand. For the 50th animated feature to come out of the House of Mouse, Tangled is a sure-fire crowd-pleaser. © 2011 – 2019, Rodney Twelftree. All rights reserved. These straight-to-video Disney spin-offs don't thrill me but having seen the trailer I can agree the animation really is wonderful. Dude, this ain't no straight-to-video effort! 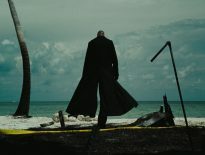 This is a legitimate feature film, and it's pretty awesome! i saw it with my 14-year-old daughter, who may have been too old for it, but we both enjoyed it. Still, it's not one we continued talking about afterwards. Yeah, this never struck me as a film a teenage girl might enjoy or truly appreciate – a younger girl, or someone 20+ with an appreciation of film, perhaps, but not somebody about to hit puberty. Hi Rodney, I feel like I've known you from comments on blogs I follow, but I'll be stopping by often. I like your thoughtful comments on Aziza's post on Passion of the Christ. Btw, I LOVE this film. I had trepidations about it as I grew up watching Disney Princess movies, but I ended up really enjoying this. The songs are great and I really connected w/ the characters. Definitely a sure-fire crowd-pleaser, nice review! Thanks for stopping by, and we're most definitely glad to have you on board! Always good to have another voice to bounce things around with! 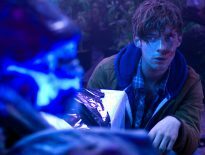 Yeah, I really enjoyed this film too – it surprised me with just how sweet it was, but at the same time how funny it was too, something I wasn't prepared for when I saw the trailers for it. My personal favorite – "Mother Knows Best" – is vintage Disney. I can't add anything in reply except to reiterate my long-held belief that story – to the exclusion of all else – is key. Without it, all you're left with is a Terrence Malick film.